He wasn't a well known rally driver or instantly recognisable event organiser, nor was he a widely recognisable face in motor sports marshalling or officialdom, but Richard Hyslop was a vital part of Scottish and British motor sport. He was one of the unsung background heroes on which our sport depends. Many of you will know him better as Piper 5 Recovery and quite a few of you will have rather special cause to remember his variety of Land Rovers over the past 20 years which have dragged rally cars out of ditches and race cars out of tyrewalls. Richard was one of those countless numbers of volunteers who turn out to motor sporting events around the country, every weekend of the year to offer their time and support to others, especially when things go wrong. In March this year he underwent a major transplant operation, and yet knowing this was about to happen had already purchased a 'newer' Land Rover Defender pick-up to replace his ageing Defender which had previously done much sterling service. He intended to spend his 'recuperation' fitting-out the new vehicle in anticipation of more recovery work to be done. Indeed his most recent 'call of duty' was at the BTCC race meeting at Knockhill a couple of weeks ago after having to choose between attending the Grampian Stages or the race meeting. Sadly, he passed away suddenly and unexpectedly shortly afterwards, due to causes entirely un-related to his kidney transplant. He was only 42. I didn't know him well, but we always exchanged greetings, the last time on the Mull Ferry. It's funny how those who might otherwise have much to complain about in life, always have the biggest smiles. He was even known to work at events south of the border. For over 20 years he was deeply involved in all forms of the sport, initially servicing for his pals in rallying before moving on to the volunteer side of the sport. More recently he was involved in the ongoing training process for new safety and recovery crews to ensure that more volunteers were introduced to the sport and brought up to standard. For sure, there will be silent gaps in the forest and deserted parking bays at race circuits where Piper 5 was once stationed and which will now be taken over by new vehicles and call signs. But the sport will still miss him, although none more so than his wife Hazel, daughter Natalie and son Jake, their wider family and huge circle of friends. Our thoughts and good wishes must be with them now. The funeral will take place at 11.30am on Friday 26th August 2016, at Dunfermline Crematorium, Masterton Road, Dunfermline, KY11 8QR. 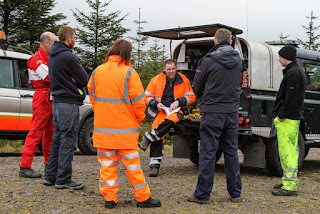 Just one wee note if your planning to attend - it would appear that some of the other rescue crews are planning a convoy to the Crematorium, so just take care on the approach!